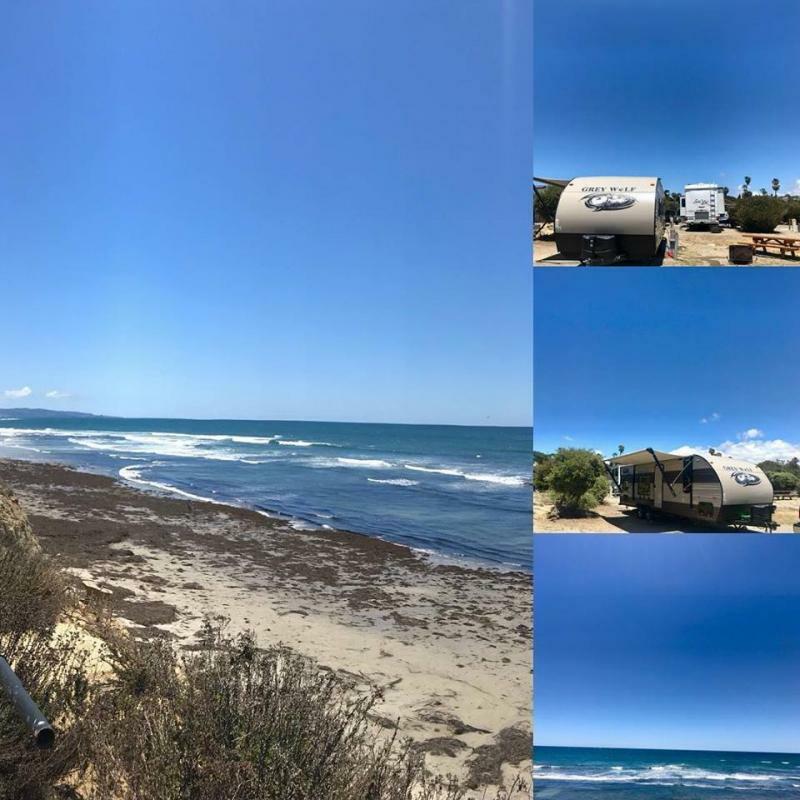 We now deliver and set up RV, Travel Trailers & Tent Trailer Rentals at South Carlsbad State Beach Campground, Call us at 858-598-5829 for more details! Discounted weekly rates also available for Carlsbad State Beach Rentals, call us for details. Rates may differ during holiday or peak travel season. Carlsbad State Beach Campground is on the bluffs above a large sandy beach in Carlsbad. You can do surfing, fishing, boogie boarding, biking, hiking, kayaking and nearby trails are used for jogging at Carlsbad State Beach Campground. South Carlsbad State Beach Campground does not offer day use facilities, but the beach is public and anyone can use the beach below. The campground does not offer public beach parking only, parking is for guests staying at Carlsbad beach campground or their guests. Carlsbad state beach campground has a small convenience store located in the beginning of the campground. However, the campground is near local stores, Costco, a surf school and retail outlet stores. But these stores aren’t within walking distance. This park will make you take your rv back each year to enjoy it. Each site at Carlsbad SB campground features a fire pit for wood burning and a picnic table. 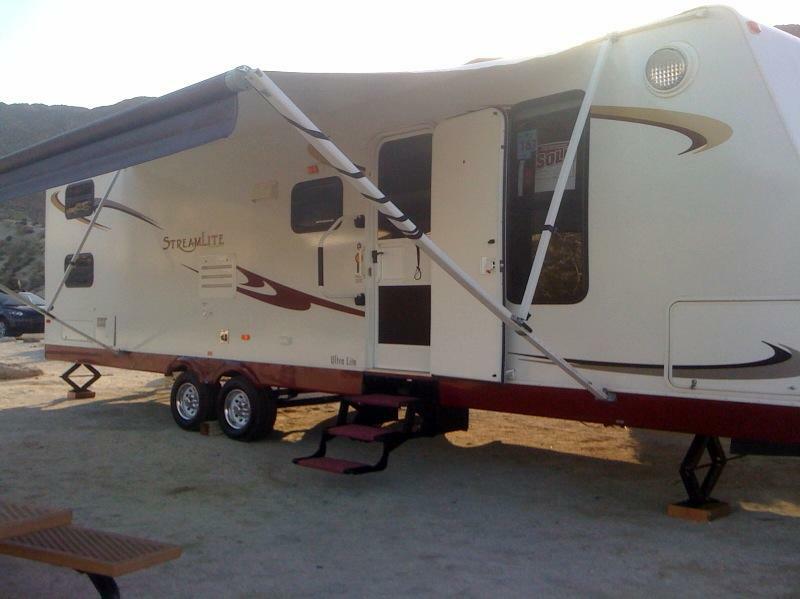 Carlsbad CA camping beach has sites can accommodate up to 8 people. Carlsbad state beach campground has some hook-ups and also dry-camping area. Most sites have large bushes between them for privacy. 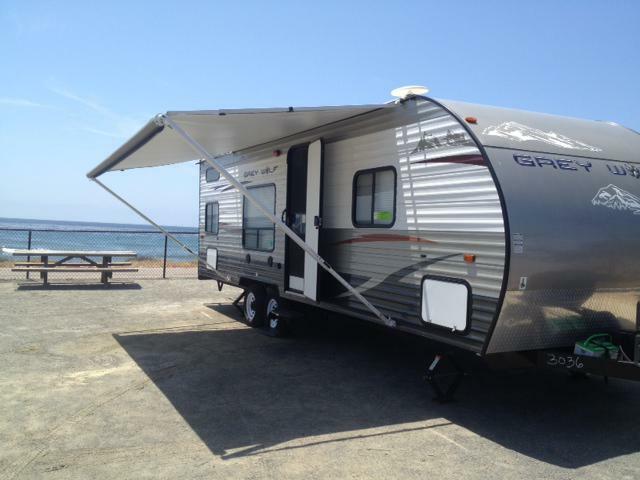 The sites can fit up to a 35ft RV, 5th wheel, Toyhauler, travel trailer or Motorhome. Most people can also fit one vehicle into their site in addition. Carlsbad Beach Campground Park kiosk hours are 7:00 am to 10:00 pm daily (see Reserve America for more details). Okay, now you’re ready to make your reservation at South Carlsbad SB Campground. What are the best campground sites? The sites close to the stairs are the best since the walk to the beach can be long if you get a site far from the stairs. But being at a site right next to the stairs can be annoying if people cut through your site. Also, the sites main store is a little busy with vehicles and foot traffic. Bring a camping checklist so you don’t forget the important items such as sunscreen. But don’t worry, Carlsbad beach Campground has a store for items you might have left at home. Make sure you arrive at the campground in Carlsbad during the day and print a campground map so you don’t waste time searching for your spot. Don’t forget the surf boards and boogie boards, they make not be available during the winter months from area stores. Carlsbad State beach is right off highway 5. The beach is located 3 miles south of Carlsbad on CARLSBAD BLVD.Take INTERSTATE 5, exit PALOMAR AIRPORT ROAD. Go west to CARLSBAD BLVD - SOUTH.Turn SLIGHT RIGHT onto ramp CARLSBAD BLVD. – SOUTH. Merge onto CARLSBAD BLVD. – SOUTH, continue 1.6 miles to campground entrance. Getting reservations at Carlsbad ca camping beach can be difficult during peak times, so make your reservation far in advance. You can make your reservations online at www.reserveamerica.com or by calling 800-444-PARK. Using their website is the easiest choice because you can search different. If they are booked during the times you are looking for try these other great choices of campgrounds in the area: Campland on the Bay, Santee lakes, San Elijo in Encinitas, Silver Strand State beach or Koa in San Diego. Also, often people resell campsites on Craigslist so look there too. Online reservations are available 24 hours a day, seven days a week. Reservations can be made 7 months in advance on the first day of the month beginning at 8:00 a.m. PST via the website or by calling 1-800-444-7275.